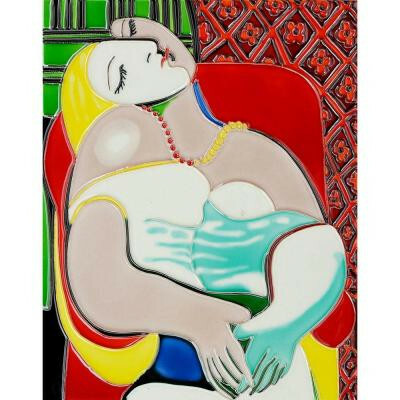 Own a beautiful hand carved and hand painted ceramic tile replicated after Pablo Picasso's, The Dream. Ceramic tile has been a traditional means of decorating back splashes in kitchens and bathroom walls for many years. Now add beautiful art to any tile project in your home with these hand carved/hand painted accent pieces. This individual tile is 11 in. wide by 14 inches tall. Picasso was recognized by his father as a child prodigy by the age of 14. Pablo Picasso pioneered the modern art movement called Cubism and is widely acknowledged as the most important artist of the 20th century. This work of art has the same emotions and beauty as the original. Why not grace your home with this reproduced masterpiece It is sure to bring many admirers! You can buy this product in our internet market. We will be glad if you make the right choice.